Students learn best if they enjoy and love what they do. Besides all the learning and assignments, I regard it as essential that they develop passion and joy for their profession. Suffering becomes visible in design, while the joy of creation lets the outcome (no matter whether type, book or graphic) look light, simple and natural. Some students struggle to develop this joy in the context of class assignments. I have been teaching at a women’s college in Kyoto, Japan since April 2017. And it is sometimes hard to judge whether the young women are actually enjoying their studies or not. Sometimes, we require input from an outsider, as well as a situation that is out of the ordinary. So we held a workshop on a Saturday, run by the Japanese design studio Dainippon Type Association, to trigger the passion of the students. In 1993, Dainippon Typo Kumiai (Grand Japan Type Association) was founded by Tetsuya Tsukada and Hidechika in Tokyo. Tetsuya and Hidechika studied together at university. The name Dainippon Type Association may give the impression of a grand, public design organization, but in reality, it is only the two of them, with the ambition of becoming the leading studio for typographic design in Japan. To me, they have a clear lead over their competition for thinking out of the box and experimenting with words and the visual interpretation of Japanese writing. 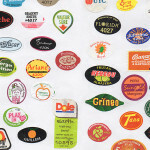 They not only address fellow designers, but ordinary people as well. 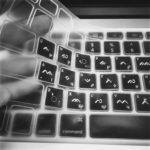 Dainippon Typo Kumiai create work in the field of traditional print media such as corporate design, book design, lettering, package design and they are involved in various exhibitions and workshops. 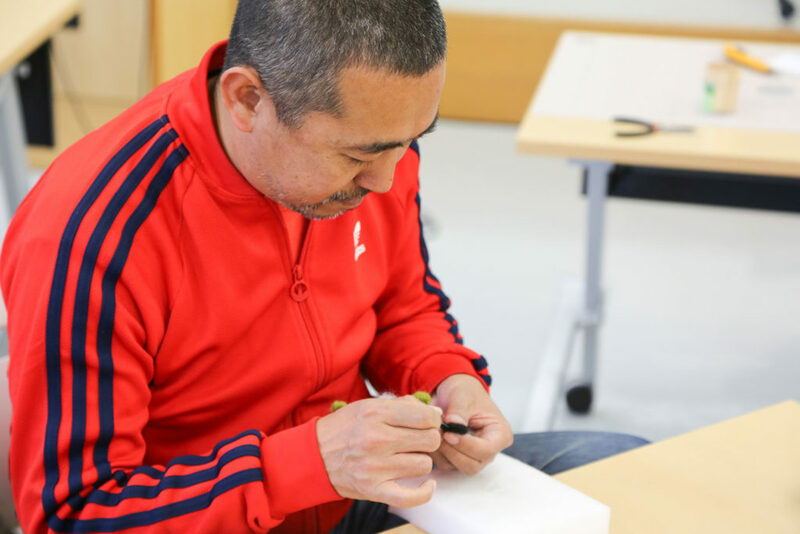 It was always my wish to invite Tetsuya and Hidechika to conduct a workshop for my students. To have them as an early Christmas present for my students just felt perfect. 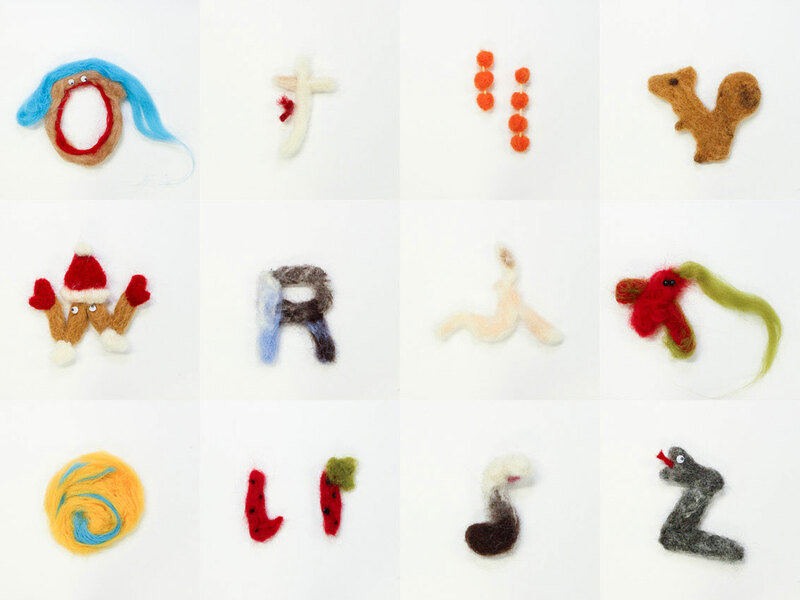 The interesting subject was: shaping letters and characters by needle felting. 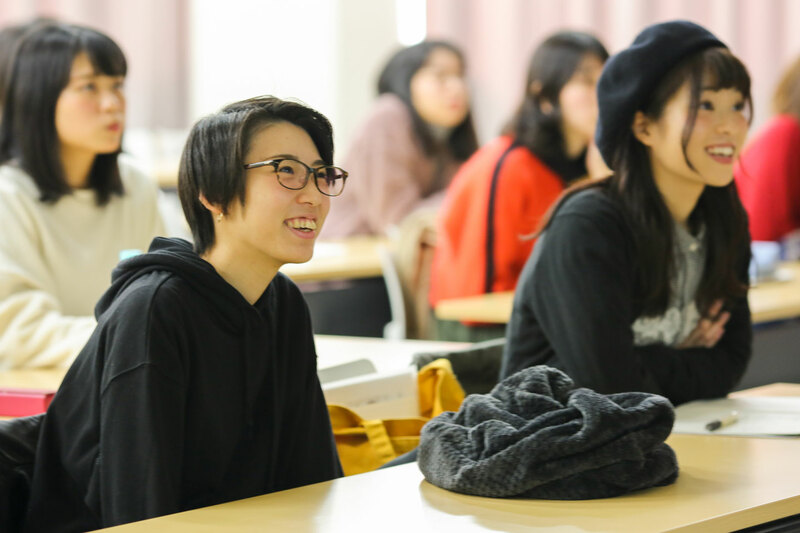 The workshop started on a Saturday morning early in December at the Information and Media Department of the Doshisha Women’s College of Liberal Arts. 14 students from Years two to four participated. During the introduction slideshow, I already saw the faces of some of the students changing, expressing curiosity, delight and interest. The workshop with a lot of drawing: 26 uppercase Latin letters were waiting to be picked. 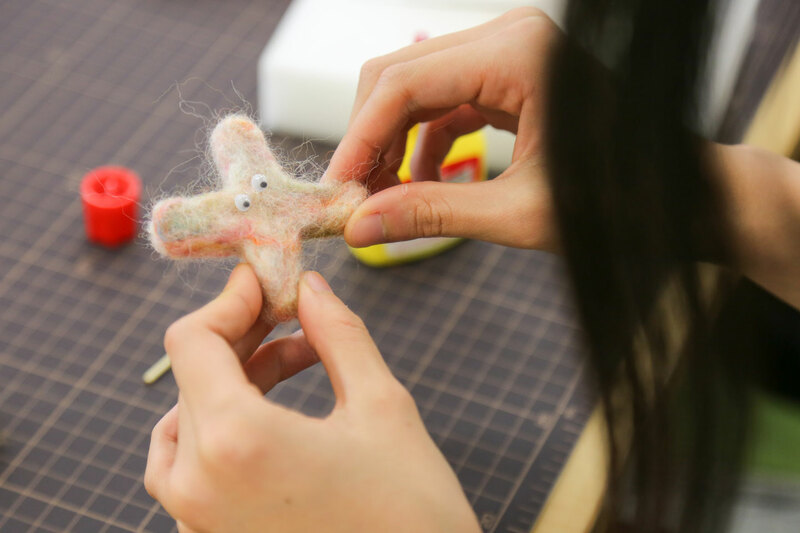 Some of the students had experience in making felt, however, no one had made a letter or a character (of the Japanese script) with felt before. Two to four students surrounded one table and soon they began to work on the assigned letters. In the beginning, there was some hesitation. 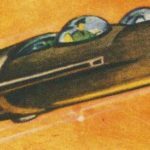 How could we change two dimensional forms into three dimensional objects? How would we deal with the fluffiness of felt and what color would suit which letter? 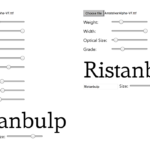 Or an even more essential question, what features does a letter need in order to be recognized? In the early afternoon, the set of 26 uppercase Latin letters and additional marks (#, @ and ?) were done and Tetsuya, Hidechika and the students decided to extend the character set by 46 Hiragana (Japanese syllabic script) . In the end, each student developed their own style. One made each form very precise, her felt-letters were dense and well-shaped. 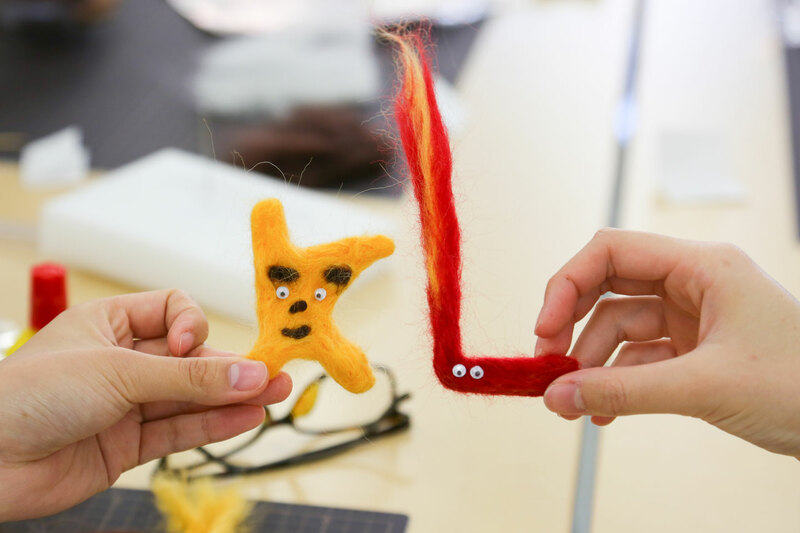 Others created faces and animal-like creatures with reference to a letter or a character. 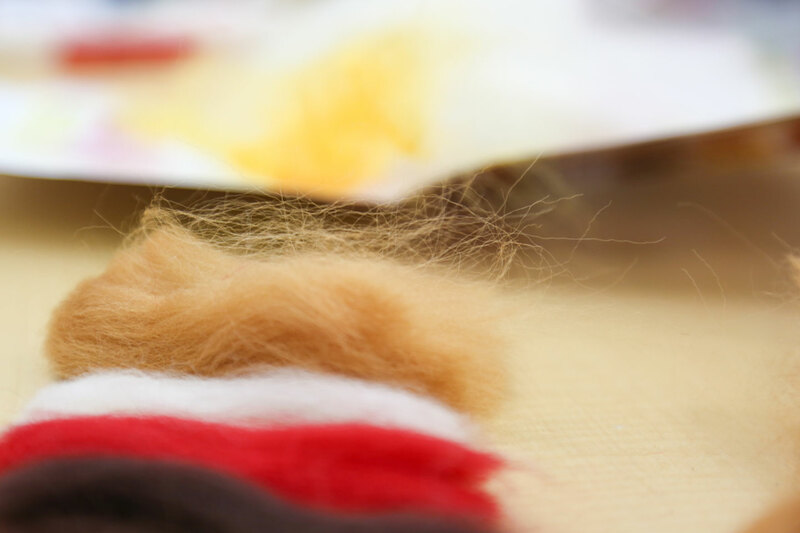 Another explored different methods of putting the wool (the material before becoming felt) into shape. Yet another experimented with dynamic shapes that elongate to one side. Some aimed for kawaii (cute) style. Also there were certain alignments between the group of people surrounding one table, regarding the consistency of sizes or style. K and L made at one table by two different students. It was a productive and fruitful time and I hope the participating students keep this creative mindset, the joy of design and the attitude of challenging the limits. Furthermore, I hope that they apply these skills in their projects whenever possible. 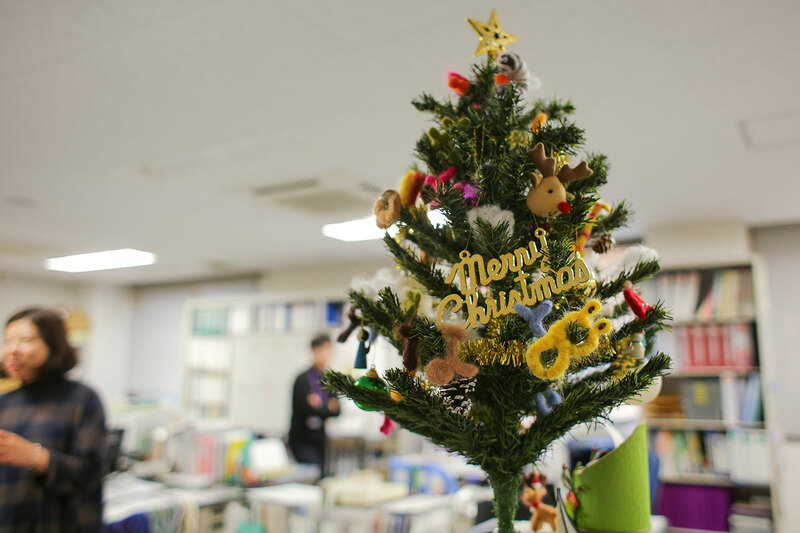 The felt-letter and Hiragana creations are now decorating the Christmas trees at our department. A huge thanks to Tetsuya and Hidechika! And let’s plan a new workshop for 2018. 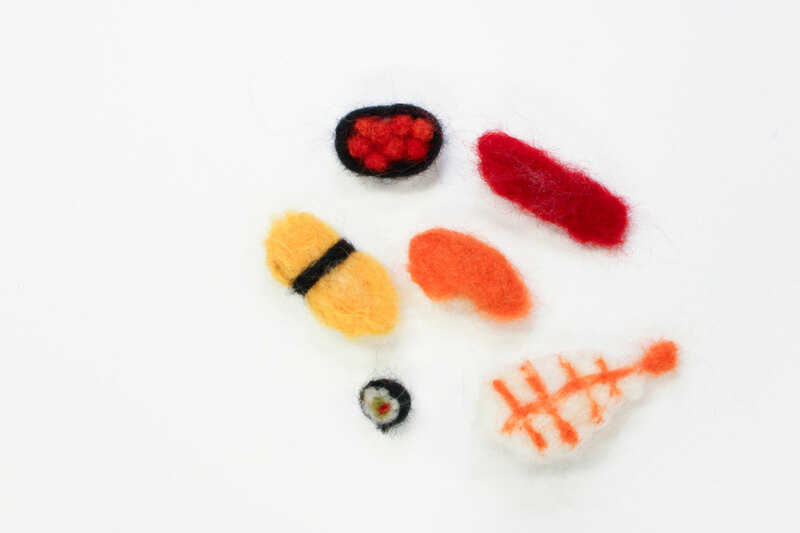 Some students preferred to make sushi from felt, instead taking a break. 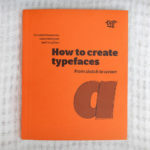 Mariko Takagi is a German-Japanese typographer, an author and designer of books and an educator. Her special interests are Japanese, Chinese and Latin letter based writing systems. After six years in Hong Kong and a short stay in Germany, she is currently based in Kyoto, Japan.